Dive each day into the Battlefield of the Mind with this complimentary devotional that helps you regain control in every day. Feel stressed, worried, doubtful or down? #1 bestselling author and speaker Joyce Meyer offers a companion devotional to her award-winning message, Battlefield of the Mind. Joyce Meyer is known for her million-copy bestselling Battlefield of the Mind in which she encourages readers to take control of their negative thoughts and live a more empowered and fruitful life in God. Now she distills her core message into a new 100-day devotional. Day by day, readers will gain new insights into the pitfalls of negative and defeatist thinking and learn ways to promote a healthier and victorious mindset. With multiple pages of complementary Scripture and closing prayers designed to focus readers on each daily message, the BATTLEFIELD OF THE MIND DEVOTIONAL will provide Joyce Meyer`s personal thoughts on "winning the battle in your mind." Battlefield of the Mind Devotional by Joyce Meyer was published by Hodder & Stoughton in October 2005 and is our 13900th best seller. 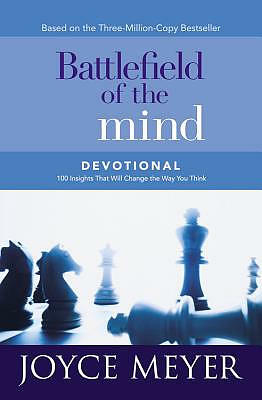 The ISBN for Battlefield of the Mind Devotional is 9780446577069. Be the first to review Battlefield of the Mind Devotional! Got a question? No problem! Just click here to ask us about Battlefield of the Mind Devotional.